MFA 2019 show, Sacred Wasteland. Free for Members, $5 for non-members. Space is limited. Sign up below for the morning session of Art Adventures. Note: If you are registering more than one child, please fill out a separate online registration form for EACH CHILD. The Ackland Art Museum will participate in the Blue Star Museum program from May 18th to September 2nd. This year’s annual luncheon speaker will be Barbara Babcock Millhouse, founder of Reynolda House Museum of American Art in Winston-Salem. 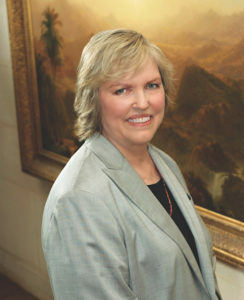 In addition to being founder of Reynolda House and the driving force behind the museum’s exemplary collection, Barbara Babcock Millhouse also has an outstanding private collection of American art ranging from the eighteenth century Hesselius portraits to twentieth century artists such as Andres Serrano and Lee Krasner. Several of her modernist pieces are currently in the Hopper to Pollock exhibition at Reynolda House. Her small sculpture collection includes such notables as Noguchi and Archipenko. CLICK HERE to purchase your tickets!! For questions please contact Hailey Hargraves. Hosted by Arts Everywhere, join fellow students and community members in a lively discussion about contemporary artist Louise Bourgeois and her work at the Ackland Art Museum. Can a meme be a way of engaging with a work of art? Can a meme describe how and what we see around us, both individually and collectively? How does such description differ from traditional ways of interacting with art in and outside of a museum? How does the location of a work of art (outside rather than inside) condition or liberate the viewer’s interaction with it? The installation of artist Louise Bourgeois’s Crouching Spider and Eye Benches I on UNC’s campus inspired a variety of responses. Louise Bourgeois was a hugely influential contemporary artist, and Crouching Spider manifests some of the major themes of her work. We’ll be giving some background on Bourgeois and her art, but also facilitating an open discussion of some of the dank spider memes generated by UNC undergrads. These productions comment on collective emotional and intellectual experiences of the art, compare it to other structures on campus, and draw out some of the political implications of public art. This event will also include a walk over to Crouching Spider, where the Ackland Art Museum’s Object-Based Teaching Fellow, Alexandra Zeigler, will lead us in an exercise in close looking, encouraging us to deepen and critically examine our responses to the sculpture and its context. Free, no registration required. Light refreshments will be served. Join Dr. Cecelia Cavanaugh for a discussion of poet Federico García Lorca and his contemporary Santiago Ramón y Cajal. Learn more about the world of Cajal and his drawings as featured in The Beautiful Brain. Cecelia Cavanaugh, SSJ, PhD, is the Dean of the School of Undergraduate Studies at Chestnut Hill College in Philadelphia. A former doctoral student at the University of North Carolina Chapel Hill, Dr. Cavanaugh has since studied at the Instituto Cajal and the Fundación Federico Lorca. Her work closely examines the connections between art and science. Her research focuses on neurobiology, Spanish art and literature, and poet Federico García Lorca . Santiago Ramón y Cajal met Lorca at the Residencia de Estudiantes in Madrid. This Art for Lunch talk is co-sponsored by Dr. Terry Rhodes, Interim Dean, College of Arts and Sciences. Image Credit: Federico Garcia Lorca at a microscope in Pío del Río Hortega´s laboratory. ©2011 Artists’ Rights Society (ARS) New York/VEGAP, Madrid. Bring your own bag lunch. Requested but not required. RSVP . Marie Li is a student at Columbia University majoring in Art History and Business Management. During the summer of 2016, she was communications intern at the Ackland Art Museum. Every year, as the sweet summer air creeps up on North Carolina with dragging feet, I am galvanized. Not by the thought of long days, crisp evenings, and cool drinks, but by the tantalizing promise of possibility. Like many other Americans, I commit myself anew to eating healthier, venturing outdoors, and exercising more often. And like it or not, this regiment centers on running outside (as opposed to on a treadmill, within an air-conditioned gym), and forcing my lungs to muddle and struggle through the dense, unforgiving humidity. I discovered on a personal tour of his collection that, like me, Burk Uzzle also partakes in the occasional morning run. Unlike me, however, he brings his camera. And it was on one of these runs that Uzzle captured the “Mustang Girl,” in St. Petersburg, Florida. Burk Uzzle, American, born 1938: Mustang Girl, St. Petersburg, FL, 2001, 2001; gelatin silver print. Ackland Art Museum, The University of North Carolina at Chapel Hill. Anonymous Gift, 2008.3.52. Nic Brown is an assistant professor of English at Clemson University. He is the author of the novels In Every Way, Doubles, and Floodmarkers, and his writing has appeared in The New York Times, Garden & Gun, and the Harvard Review, among many other publications. When Burk Uzzle was twenty-one, he was married, had two sons, and was living in Atlanta with his family trying to make ends meet by taking photographs. The family was so poor that in place of a dining table they ate off a board that they had closed in a window, making it stick out straight. A year later Life hired him as a staff photographer and had him move to Chicago. Uzzle was so accustomed to poverty that he directly checked into the Chicago YMCA. When his editor heard, he immediately moved Uzzle into a hotel with an expense account. One of Uzzle’s first assignments was to fly to South Dakota to shoot a blizzard, but he didn’t own a warm enough jacket, so upon arrival he bought a huge shearling one, only to then have to fly to some tropical locale for his next assignment, still wearing his shearling jacket. After only a few years with Life, Uzzle quit to hitchhike across the country in hopes of taking photos that captured the experience. Life hired him again when he returned, on the strength of his work. Soon he quit again. At Woodstock, which Uzzle initially visited out of curiously but ended up getting stuck at because of the New York State Thruway getting closed, he found many of his photographer friends in the press pit in front of the stage. “You’re wasting your time down here,” Uzzle told them. He had quickly come to realize that the real pictures of interest weren’t of Joan Baez or Canned Heat on stage, but of the skinny-dippers in the ponds, of the young people trying to stay warm in the fields. While his friends followed the orders of their editors and stayed put in the press pit, Uzzle borrowed film from them, walked up the hill, and captured on it images that have become so iconic that when we now think about this turning point in the country’s history, we see in our mind a Burk Uzzle photo. The point is, Uzzle has lived his life with an almost daredevil belief in art, eschewing financial stability and comfort for a single-minded trust in the work itself. “I’ve always lived for the picture,” he says. It seems terrifying. And yet he’s still doing it. Artwork hung in a museum is, in a way, like reading the history of war. We see the outcome as inevitable. Here is the art hanging right here, it was meant to be here; here is the winner of this war, they were always going to win. But of course, as people will tell you who lived through wars, the outcome is never foretold. So it is with art. In Uzzle’s life, as he was shooting many of the photos in this exhibition, what he probably saw in his future was less a vision of his name on a museum wall, and more a vision of his dinner resting atop a board closed into a window. What I’m getting at is something we hear about often – the struggle of the artist. Uncertainty and risk. Burk Uzzle has spent a life taking the biggest risks, putting all of his chips on the table. So take a look. He’s spent years now cashing them in. The payoff has been developed, matted, and framed. It’s like we all know the best poker player in town, and not only is he still playing, he always shares his winnings. Townsend Ludington is Boshamer Distinguished Professor, Emeritus, of American Studies and English at UNC-Chapel Hill. All About America: Photographs by Burk Uzzle, which opened at the Ackland Art Museum on June 24th, is one of the most provocative exhibitions the Museum has offered during the many years I have had the pleasure to live in Chapel Hill and teach at the university. “Provocative” in no way meaning salacious, but because—along with the fine catalogue of Uzzle’s photographs and an insightful essay by Professor Patricia Leighton—we learn so much about the art of photography. Burk Uzzle, American, born 1938: Family and Friends, Daytona Beach, FL, 1997, 1997. Ackland Art Museum, The University of North Carolina at Chapel Hill. Anonymous Gift, 2008.3.48. © Burk Uzzle. Uzzle rightly considers himself both artist and photographer; no one would challenge him. All 42 of the works on view display the visual acuity of a greatly talented professional; each has a narrative about some aspect of American life during the turbulent years 1968-2014. Ordered chronologically, the first photographs take us back into such monumental moments as the death of Martin Luther King and its aftermath; Woodstock; the Peace movement, and then—like Uzzle himself, it would seem—into a more elegiac mood in the last photographs.